And not just any cheese cake. Ellie’s Mini Cheesecakes with Strawberries. And Blueberries. The theme this week for Eating with Ellie was Red, White, Or Blue. But since it was the Fourth – our most important American holiday celebration – I just couldn’t pass up the chance to go Red, White, AND Blue!! This is a no-bake cheesecake with a graham cracker crust. The little cheesecakes are made in muffin cups so 1 is just perfect for a quick sweet bite. And since Cheesecake is one of my fave desserts it wasn’t hard to make this one. Since there are no eggs in this recipe you just have to mix up the ingredients and pour the batter into the cups over the baked crusts. Easy Peasy! Ellie tops her cheesecakes with sliced strawberries. There weren’t any decent ones in the store so I mixed in some home-made strawberry jam and topped with some blueberries instead. And on some I just topped with strawberry jam and blueberries. You can never have enough red white and blue. The only thing wrong with these – the crust gets soggy after a couple of days in the fridge. Check out the rest of Red, White, or Blue on Eating with Ellie! I had this brilliant Idea for this month’s Bundt Bakers’ SPRINKLES theme. Instead of going with a regular cake with colored sprinkles I decided to make a cheese cake ‘sprinkled’ inside with mini chocolate chips. In my head it would come out beautifully. 6 little perfect cheese cakes. Dotted with chips. Little sprinkles of cookie on the top. The angels would sing. The unicorns would dance. I would be the Belle of the Ball! Instead I ended up with 6 stuck in the pan, partly collapsed, but great tasting, mini bundts. So much for brilliant ideas and head pictures. Cue the little Elves of Mischief instead!! 1 cup finely chopped chocolate sandwich cookie crumbs. Mix cream cheese, sugar, flour, salt and vanilla until very light and fluffy in a large mixing bowl, scraping sides of bowl occasionally. Add eggs one at a time. Mix on medium-high speed for about two minutes. Add cream and mix well, scraping sides of bowl occasionally. Stir in chocolate chips. Spoon mixture into prepared pans til they are about 3/4 full. Bake at 300 for 55 to 65 minutes or until set. Cool upright in pan 30 minutes. Refrigerate 2 hours. 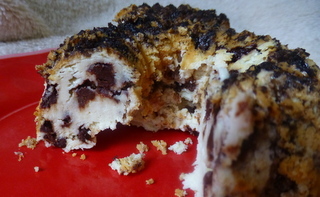 While I used the recipe in the book, you could use your favorite cheese cake recipe and just add in some mini chocolate chips. I’m sorry! What month did you say this was? What? Already? Well, that year went fast. Now, don’t misunderstand 2014 is not over yet. In fact we still have (at this writing) 7 1/2 weeks left. But it is the last month for The Secret Recipe Club for 2014. Group C won’t post again until January 2015. 2015? Wait! What? Already? 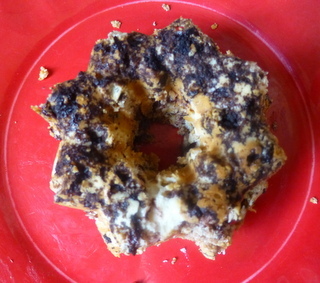 The bright part of the month is finding and then posting (third Monday) new recipes from a new found foodie blog. And this month was just as much fun and just as hard as every other month since I joined SRC back in June 2011. Since that time I have never ever been able to find just one recipe for SRC so I end up making 4 or 5 and then posting about 2 or 3. With so many good dishes and so many great recipes how can I cook just one? Weekly Inspirations – “will consist of quotes that resonate with me to a section on my favorite food bloggers to career advise to Bay Area favorites to wineries and restaurants to simply interesting inspirations. I hope you enjoy seeing what inspires me and hopefully will inspire you.” with recipes. Cheese cake is right up there with bread pudding in my dessert list. There is nothing better IMO than a good rich flavorful cheese cake. And this one is right up there. 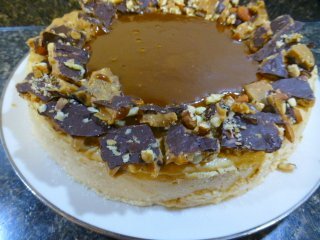 A decadent toffee flavored cake topped with a rich caramel sauce and pieces of almond/pecan toffee. **SWOON** I made it without the crust (she suggested gingersnaps but…), but next time I think a chocolate cookie crust would be great. 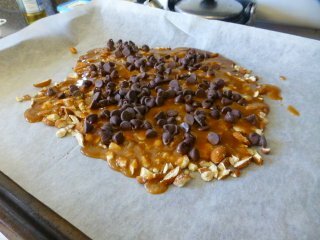 And since I completely forgot to add toffee to my shopping list I was forced to make my own. Oh, the sacrifices we make! 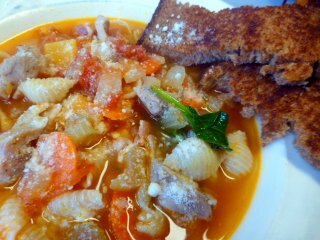 Minestrone is a thick soup of Italian origin made with vegetables, often with the addition of pasta or rice. Yep! That’s what this was. Full of celery, onions, toma…. well, here is her recipe. Browned chicken meat – altho Lisa didn’t call for this. Add the tomatoes, 6 cups of the chicken stock, the bay leaf, 1 tablespoon salt, parmesan rind and 1 ½ teaspoons pepper to the pot. Bring to a boil, then lower the heat and simmer uncovered for 30 minutes, until the vegetables are tender. Discard the bay leaf. Add the beans and cooked pasta and heat through. The soup should be quite thick but if it’s too thick, add more chicken stock. Just before serving, reheat the soup, add the spinach, and toss. Cook just until the leaves are wilted. Stir in the white wine and pesto. Depending on the saltiness of the chicken stock, add another teaspoon or two of salt to taste. I cannot describe how good this was. Hearty, filling, with some toasted whole grain bread. Perfect!! 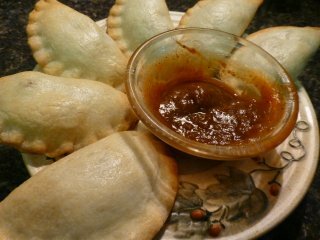 And then I just had to try one of her Friday Nite Bites and the Pumpkin Empanadas caught my eye because I had just picked, peeled, baked, cubed a few small pumpkins. 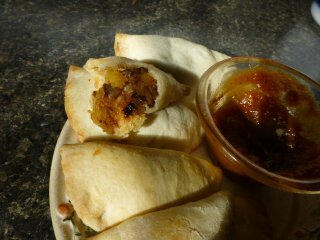 I make empanadas, or hand pies, quite often. With fruit. With meat. With left over stew, etc. But I had never made them with pumpkin. With an Indian twist by adding garam masala. One of my favorite spice blends. Instead of serving the empanadas with the Cilantro Mint Chutney I made a Spicy Pumpkin Butter by adding some cayenne to some Pumpkin Butter I had made earlier. I liked the sweet/hot flavor. I think these would be great made with butternut squash or sweet potatoes. And maybe just a smidgeon more garam masala. So many recipes with lots of time to try so many more. You HAVE to visit Lisa at Authentic Suburban Gourmet. Thanks for some great recipes, Lisa.